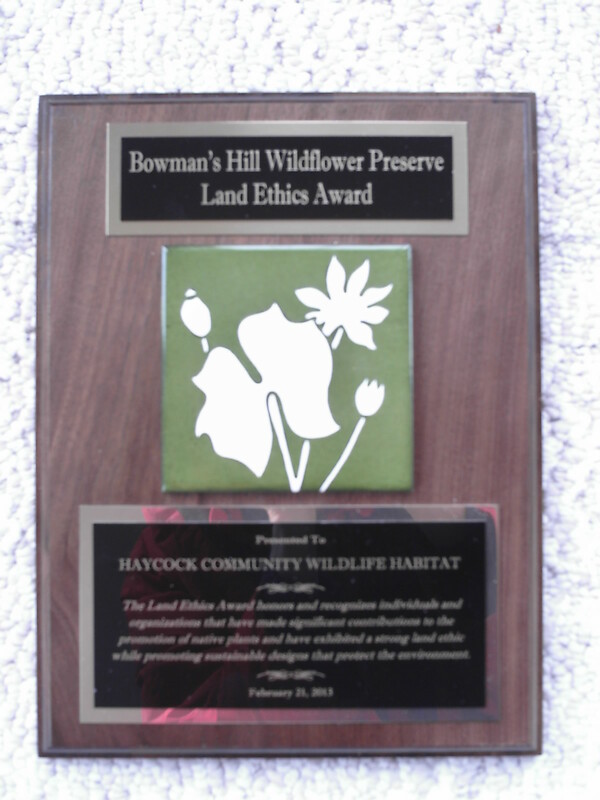 We received the 2013 “Land Ethics Award”! Julie Fagan, Team Leader of the Haycock Community Wildlife Habitat group, was presented with the 2013 “Land Ethics” award at Bowman’s Hill Wildflower Preserve’s 13th Annual Land Ethics Symposium: Creative Approaches for Ecological Landscaping held on Thursday, February 21, 2013. Notes from the 2013 Land Ethics Award Jury: “We were impressed with this project’s focus on protecting wildlife, including bees and bats, for which there is far too little public awareness and funding. The inclusion of site work to control invasive plants adds real habitat modifications to foster their goals.” “The project is also especially worthy due to the high claiber of scientific support and the extensive use of social media for public education”. The project began in the summer of 2011 with 2 Rutgers University students taking the Colloquium Ethics in Science class taught by Dr. Julie Fagan, Associate Professor of Animal Science. Student class projects are based on student interests and career goals. Lisa G. and Janice F. both had an interest in sustainability and native landscape plantings. We focused on wildlife habitat in our Haycock Township in Bucks County, PA community. We partnered with the National Wildlife Federation with the goal of certifying Haycock Township as a NWF Community Wildlife habitat. The project began with the students reaching out to community residents, going door to door, to help them make their backyard more wildlife-friendly, and doing oral presentations to convince the township supervisors to move forward with the project. The project didn’t end there. Course projects are designed to form a Wiki-like network of solutions to attain goals from divergent areas of focus. Another group of students, team 2, focused on bamboo’s invasiveness, and another (team 3) illustrated how pesticides may negatively affect the demise of the bee population due to Colony Collapse Disorder and threatening the world’s food supply. Then there was team 4 that worked on sustainable organic gardens, team 5 on the bat population, team 6 on getting other communities onboard, and team 7 on pollinator populations. In Oct 2012, The National Wildlife Federation came out to officially recognize Haycock Township as a National Wildlife Federation Community Wildlife Habitat; the 63rd in the United States. In Feb of 2013, the Rutgers University professor accepted the 2013 “Land Ethics” award. Community Wildlife Habitat Program; associated with each paper is a student-produced video, as well as a number of student-written letters to the editor which were sent and published in various paper and on-line publications. 2) Bamboo as an Invasive Species: Raising Awareness at Rutgers Gardens of the Impact on Native Habitats. John J. Daub, Janine Disanti and Julie M. Fagan, Ph.D.
3) Colony Collapse Disorder: Links to pesticides and their alternatives: A study on pesticides that may be connected to colony collapse disorder, as well as natural alternatives that can substitute them. Colin Clark, Ian Mosebach, and Julie M Fagan, Ph.D.
5) Dispelling the Myth Surrounding Bats: Saving Bats from the Emergence of White-Nose Syndrome Marco Carvello, Patrick Dziamba, Alyssa Britton and Julie M. Fagan, Ph.D.